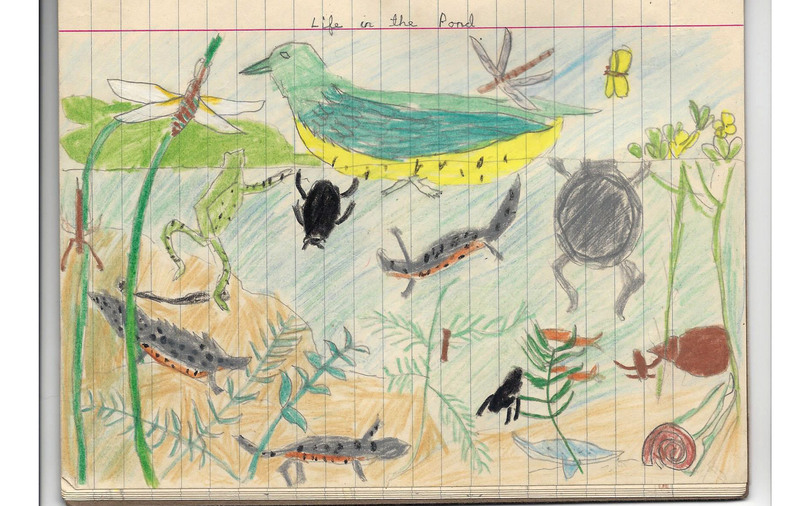 Aware that I haven’t posted much in the last week or two, I thought to delight you with this busy picture of pond life that I drew for my Nature Study homework at the age of eight. Working on a story set in a school — albeit a senior school — has made me think back to my own studies as a child. At primary school, Nature Study and Art were my two favourite subjects. The main character in my novel, Desiccation, is a 15-year-old science scholarship girl who discovers that not everything in the universe runs according to the textbook. I am nearly there with publishing, but it’s taking longer than I expected. First I took a short break to visit family in the Isle of Wight. Then I had flu. After that, in my attempt to catch up with the final proofing and corrections of my novel, I gave myself a frozen shoulder by spending too much time on the computer. But I’m on the mend now, thanks to homeopathy and qigong exercises. Will return to regular posting, plus visiting everyone’s wonderful blogs, as soon as possible. Missing you all, of course. Gorgeous picture, Sarah. I’m impressed that you still have it. Ugh @. frozen shoulder! I’ve had two of those, and it’s not fun. 😦 Get better soon. Thanks, Sylvia 🙂 Yes, I’ve had a frozen shoulder twice before and each time I hope it’s the last time. Welcome back. Love the drawing! Thanks, David 🙂 I have many more of my old school books, so plenty of pictures to post. My mother had kept them and handed them to me recently. Some of the stuff I wrote in English and in History makes amusing reading. hi Sarah, yes I have been on computer very little recently…my garden is looking great tho! And I have done much reading. And some traveling to Vienna and Hungary with my Daughter. I haven’t blogged for ages, but I am determined to put one online soon. I love eccentric novels so am going to order yours now it’s on Amazon. Hope your Christmas is lovely. Have you read Carrie Rubin’s book, Desication? She has a blog too, and is very funny. I have often made errors in comments on people’s blogs, then had to explain myself in a follow-up comment, so no need to worry. I will check out Carrie’s book. My book is spelled ‘Desiccation’. You may not find it in a search on Amazon otherwise. It is a confusing word to spell, I know!